Maxine (Fraser) Bacon, 97, passed away March 8, 2017. Funeral service will be 11:30 am Mon., March 13, 2017 at Bruce Funeral Home, Gardner, KS (913) 856-7111. Burial follows at Gardner Cemetery. Visitation 10:00 to 11:30 am before the service at the funeral home. In lieu of flowers memorial contributions may be made to Kansas City Hospice. Maxine was born in rural Gardner, KS on Oct. 1, 1919 to William H. and Lelia (Reid) Fraser. 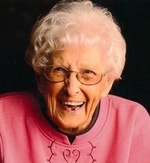 Maxine was a lifelong resident of the area. She graduated from Gardner High School in 1937 as Salutatorian of her class. After graduation she went to work at Cramer Chemical Co. and worked there until she got married. Maxine married Ray Bacon on Aug. 23, 1941 in Las Vegas, NV. In 1959 she started working at the Gardner school cafeteria as a dishwasher and worked her way up to Food Service Supervisor in 1973. She retired from the Gardner School District in 1982. Besides working outside the home, she also helped Ray on the farm until they retired from farming in 1998. Maxine was a member of First Presbyterian Church of Gardner and was Past Worthy Matron of the Gardner Order of Eastern Star. She was an avid baker of cookies, pies and cinnamon rolls, an excellent seamstress and enjoyed making a variety of crafts. She will be dearly missed by family and friends. She was preceded in death by her parents; her husband, Ray on Aug. 3, 1999; her sister, Charlotte Poole and her brothers: Howard “Bo”, Kenneth “Si” and William “Bill” Fraser. Maxine is survived by her son, Jerry Bacon and wife Ann, Olathe, KS; her daughter, Judy Koonce and husband Ken, Spring Hill, KS; 6 grandchildren and 13 great-grandchildren.